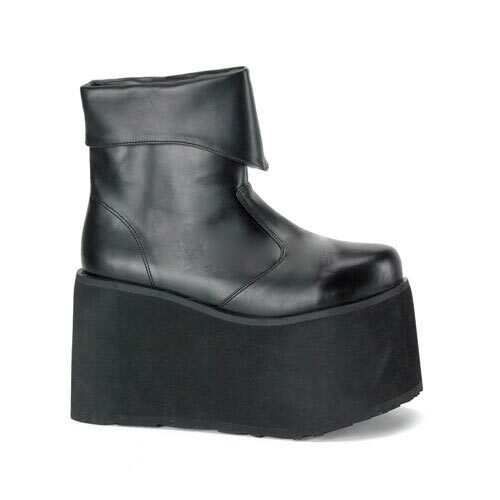 Black PU boots with a 5 inch platform. Men's Shoes Conversion: Small Size 8/9, Medium Size 10/11, Large Size 12/13, XLarge Size 14 by Demonia. 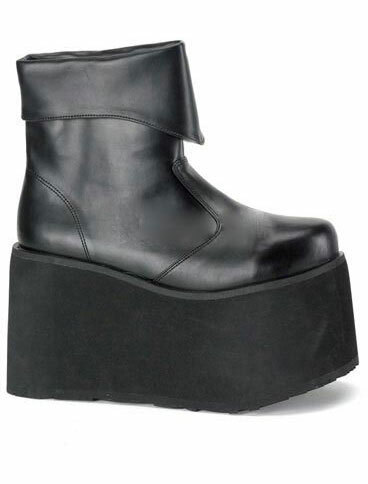 The following boot calf and shaft height measurements were taken from size 7 boots in cm. Measurements will vary slightly than what is stated for sizes smaller or larger than 7. Calf circumference measurements were taken at the fullest part of the boot shaft. Boot shaft height measurements were taken from where the upper meets the heel to the top of the boot shaft. I have enjoyed the boots very much. They are surprising stable and easy to manuever in. My 6' 2" 300 pound frame is now about 6' 9" with these on. It is fun to see the looks I get with these on. Good product, great for Halloween!! !